Bayshore framing crews are putting the roof on this house and detached legal suite in West Ridge Qualicum Beach. These lane way homes all feature legal suites. A great mortgage helper!!! Ground breaking Excavation begins on the Kams new home in Qualicum Beach. Bayshore wrapping the excavation for the QF warehouse on the Alberni Hwy. Over 28,000 square foot building. Great to see a local company doing so well!! The Goodinsons custom home in Parksville is coming great. Tilers and finishers this week! Finishing up the forming of this pool deck! Finishing up the forming of this pool deck, just in time for summer!!! Hot tub arrives this afternoon. Its all coming together at this Bayshore house. Ready to pour!! 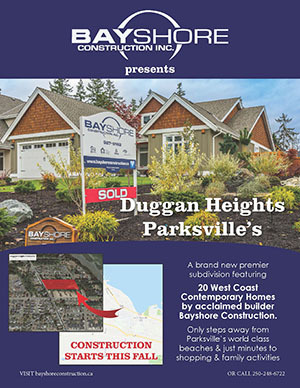 Bayshore begins the Goodinson’s custom home in Parksville.